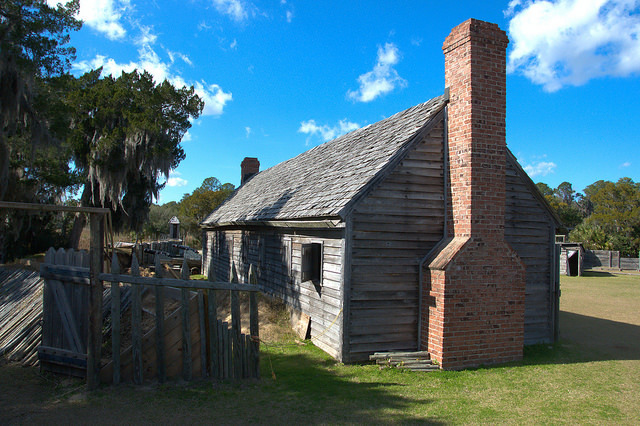 The first British outpost in present-day Georgia, Fort King George was built and commanded by Colonel John “Tuscarora Jack” Barnwell in 1721, under the auspices of South Carolina Governor Francis Nicholson. Upon its construction it was the southernmost fort in Bristish North America, manned by His Majesty’s Independent Company of Foot. 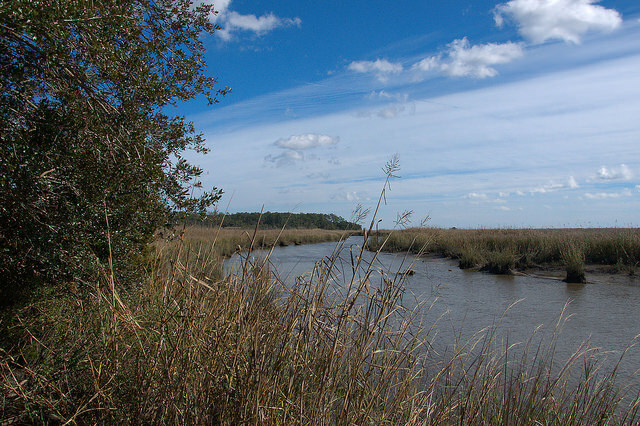 The British claimed the land along the Altamaha River as part of the South Carolina colony as a protection against Spanish forces, who sought to expand their reach northward from Florida. 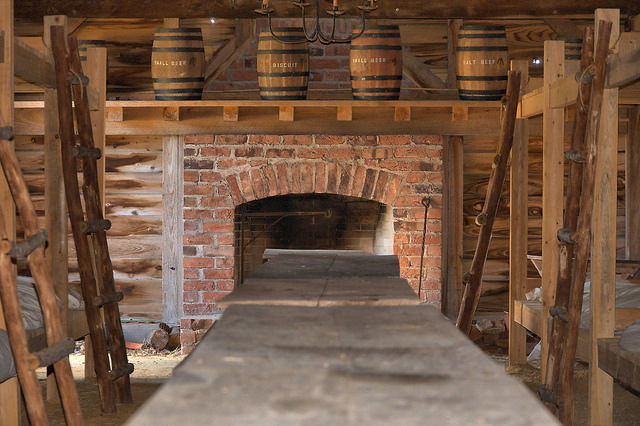 Colonel Barnwell died in 1724 and a mysterious fire claimed the fort in 1726. Rebuilt, it remained in use as a garrison until 1732 when it was officially abandoned. Upon its ruins General Oglethorpe founded Darien in 1736. 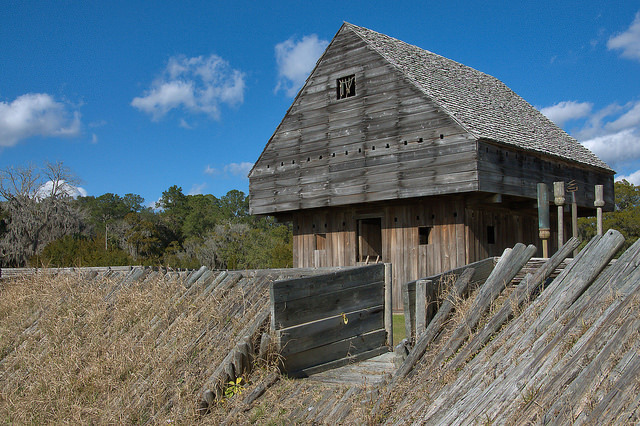 The blockhouse was built of cypress logs. 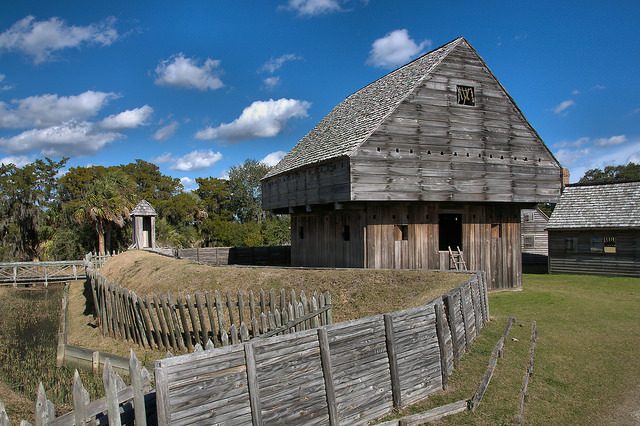 Its construction proved no simple matter in the wilderness of Coastal Georgia. Though Nicholson and Barnwell had requested fit young soldiers, they were instead supplied with members of the Regiment of Invalids, veterans who in one way or another were not capable of heavy service. 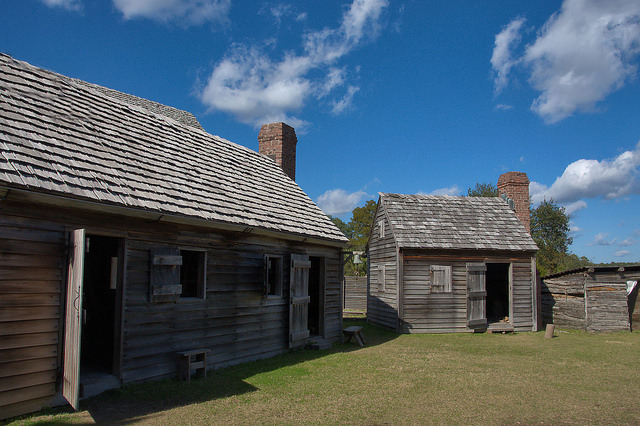 The British welfare system of the day allowed them light duty and by 1722 about 100 soldiers were sent from a hospital in Port Royal, South Carolina, to Fort King George. 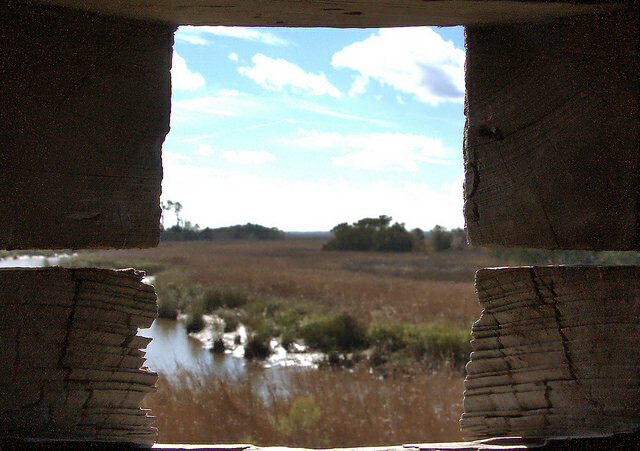 From embrasures (gun-ports) on the top level of the blockhouse, soldiers kept watch over the Altamaha River delta. 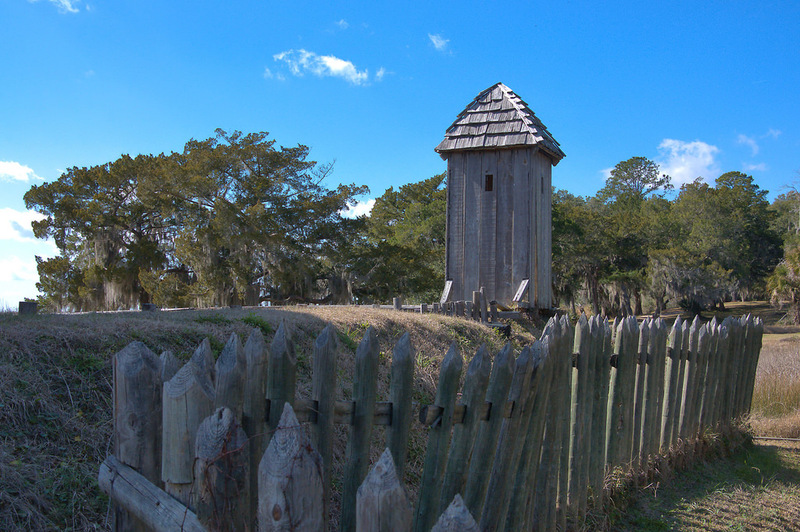 Guardhouses, or sentry towers, were also essential to the site’s security. None of the original fortification survives; the structures seen today were built using original plans in 1988. 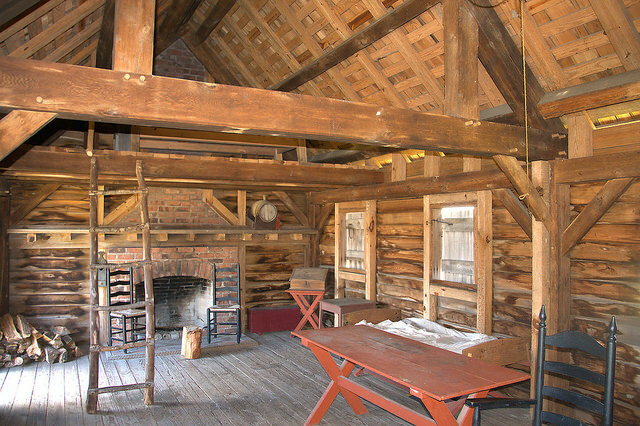 Besides the blockhouse, an officers’ quarters and workshop were also reconstructed. 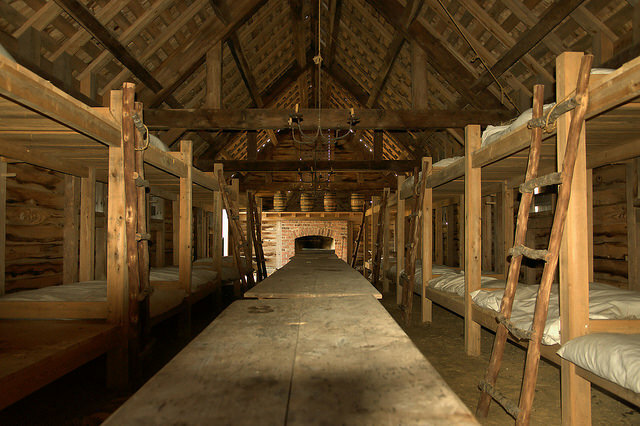 Barracks were located at the rear of the property and provided quarters for His Majesty’s Independent Company of Foot. Black Island Creek flows behind the barracks. Wow, how amazing my beloved coastal Georgia is. Thankyou for the history lesson and the wonderful photo essay. I must say that to think of anyone building anything in Georgia, way back when, seems impossible to us who are so used to the luxury of air conditioning, good food and clean showers and beds. What a daunting task in all ways….not just physically, but emotionally and mentally as well. They were so strong.